The forthcoming Border Gavaskar Trophy could decide Ajinkya Rahane’s worth and future in the Indian batting line-up. Not so long ago, Ajinkya Rahane was considered India’s best batsman in Test cricket even ahead of their captain Virat Kohli. However, things have changed dramatically over the last two years for the Indian team and Rahane. In the period, the vice-captain is facing a tough time to maintain his performance and also took the axe earlier this year. The forthcoming Border Gavaskar Trophy could decide Rahane’s worth and future in a batting line-up dominated by captain Kohli while travelling away from home. After a forgettable debut in the 2013 Delhi Test against the Aussies, Rahane sealed his place in the playing XI with his efforts on overseas tours. His dream run started from the series in South Africa and was successful everywhere he played. Rahane had at least one 90+ score in nine consecutive series which is the second longest streak for India behind Sunil Gavaskar’s ten. Team India regained the No.1 rank by big difference after completing a whitewash over New Zealand at home in 2016. In the final game of this series, Rahane scored his career best of 188. 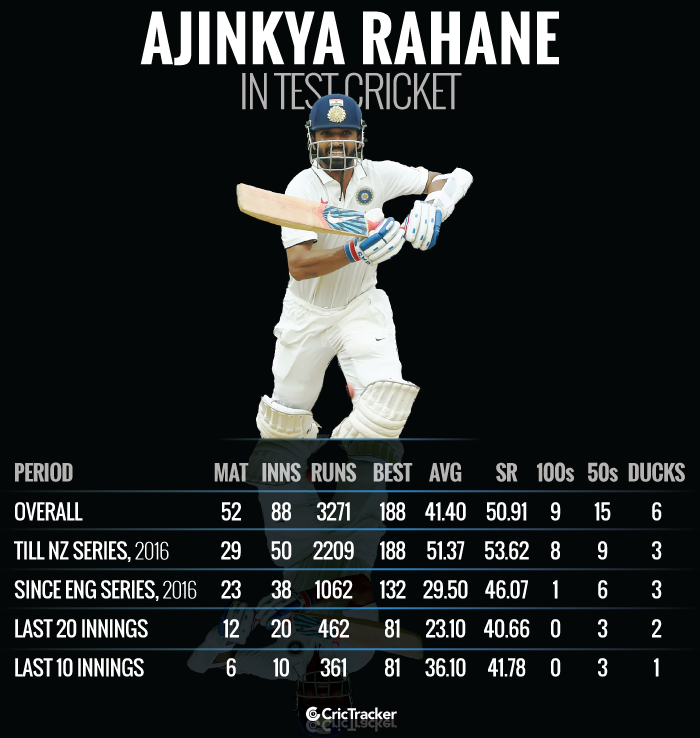 In the 29 Test matches Rahane featured in by end of this series, he aggregated 2209 runs at an average of 51.37 with eight centuries and nine fifties. Indians were expected to rule the format with Rahane’s consistency and Kohli’s intent. Just when things started going well, India lost services of Rahane in the five-match home Test series against England. However, he had a forgettable series with the bat before getting injured. He aggregated only 63 runs across the five innings in the first three Tests of the series. In the 4-match series against Australia, the Indian Test vice-captain scored 198 runs out of which 84 came in the final match in which he was the stand-in captain. The series in Sri Lanka served as a relief for Rahane where he scored 229 runs at an average of 76.33 including a hundred. But things got worse for him in the home series against the Lankans where he scored only 17 runs across five innings. This slump led to the team management dropping him for Rohit Sharma in the series in South Africa. His performances in first-class matches were convincing during this period as he missed out on two Tests in South Africa. His efforts in the overseas cycle between 2013 and 2015 earned him a tag of being the overseas specialist. 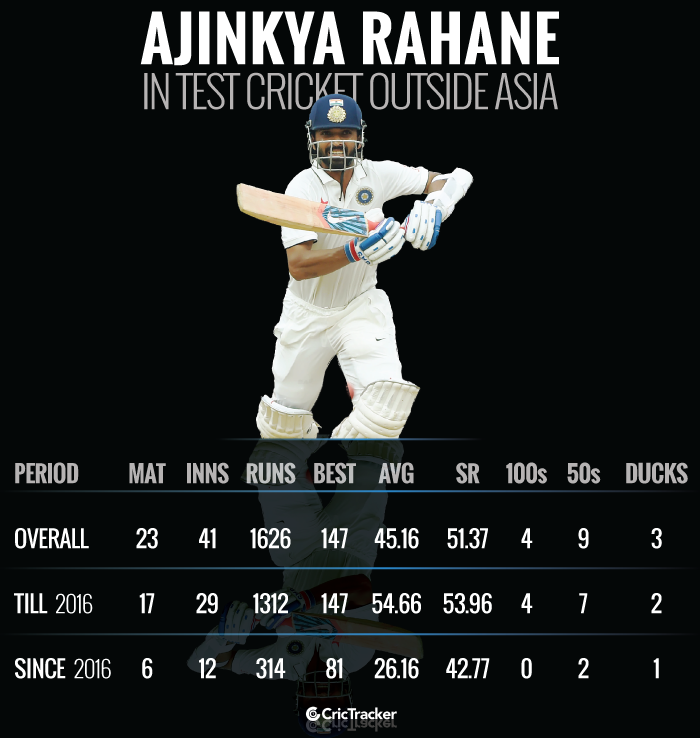 But that didn’t mean Rahane was poor in Tests in India prior to these 25 months. The Mumbaikar scored 621 runs in eight Tests in India till the New Zealand series at an average of 51.75 which was higher than his career average of 51.37 at that time. However, starting from the 2016 England series, Rahane aggregated only 519 runs in 14 home Tests at an average of 24.71. His struggles are extended into the away tours and he was found inconsistent in South Africa and England series in 2018. India won two matches in both the series where Rahane came up with a couple of crucial knocks that helped India gain the upper hand. 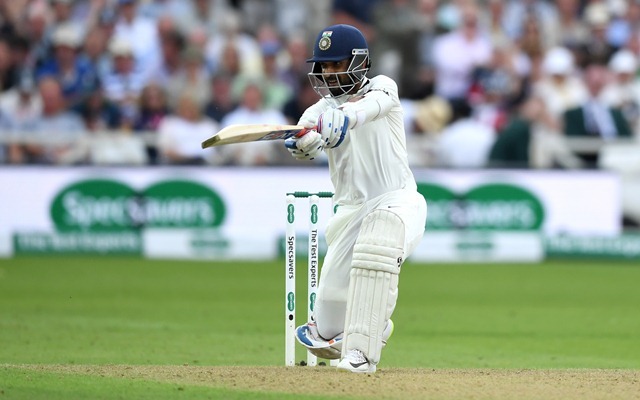 However, in the four matches in England that India lost, Rahane scored only 147 runs at an average of 18.37 with one fifty in the 4th innings of the Southampton Test. Being a senior batter, he failed to step up at crucial stages with the bat in those four matches. His experience and adaptability in the overseas conditions are extremely important for India but that doesn’t mean he can get away with being inconsistent. The axe he took at the start of the year was too early for the vice-captain but he could find himself in similar situations if his performances don’t improve immediately. The bigger reason being the lack of options the management can find for the domestic circuit. There are a few players who have excelled batting at No.5 and No.6 in the domestic circuit and have the ability to fill in for Rahane. But none of them warrants success at this level especially while travelling away. Hanuma Vihari, at the moment, looks the best bet for this role but India will need a solid No.6 if they are to play six specialist batsmen.